Check out Warnie’s take on every player traded in the 2017 NAB AFL Trade Period. The AFL Trade Period is here and Warnie will take a look at every move from free agents to team-to-team trades with his AFL Fantasy glasses on. Discuss your thoughts in the comments! Projected prices are based on an approximate magic number of 6900 (an approximation based on last season’s number) which also assumes that the salary cap will be $12,600,000, close to the official AFL salary cap for 2018. Discounts have been applied following last year’s formula where appropriate. LATEST UPDATE: Thursday October 19, 2:30pm. FANTASY VERDICT: The last player trade of the 2017 NAB AFL Trade Period saw the homesick Schache head to Melbourne and end up the Dogs. Obviously a key position player and it is only his third season coming up. Not Fantasy relevant. PASS. FANTASY VERDICT: Plenty of coaches wanted to grab Matera after he opened up his 2017 account with scores of 107 and 138. This has basically inflated his price for next season based on his six prior seasons. I can’t see him averaging in the 80s again. PASS. FANTASY VERDICT: Weller has played all 22 games of the last two seasons and has taken his average from 63 to 74 in that time playing out of the backline. I’m thinking he will be spending most of his time in the guts in a decimated Gold Coast midfield unit and numbers should continue to increase. WATCH-LIST. FANTASY VERDICT: Charlie Cameron started his fourth season with 112 and 95 in the opening two rounds but consistency will always be an issue in his Fantasy game as a small forward. TOO HOT AND COLD. FANTASY VERDICT: Put a line through Ablett as a Fantasy Classic option from the get-go. He averaged a whopping 118.9 in his 14 games (that saw him win the Suns’ B&F) which will price him as one of the most expensive in the game. Ablett will be spending some time forward – which he could do in tandem with Dangerfield and may affect his scoring – so we are best to wait for him to drop some dollars… and if he is spending a heap of time forward, be ready to upgrade in round six if he is among the first wave of DPPs. We’ll be chatting a lot during the pre-season about where you’d take Ablett in Draft. At this VERY early stage, I wouldn’t want to touch him until the second round. UPGRADE TARGET. FANTASY VERDICT: Lang has shown some signs of a Fantasy game this year. 97 v STK (25d, 2g), 98 v PA (17d, 11t) and 120 v SYD (24d, 10m) were the highlights of his season. He will be 22 going into the 2018 season and there appears to be plenty of upside if we look at his 2016 VFL numbers where he averaged 23 disposals, five amrks, seven tackles and 109 Fantasy points. WATCH-LIST. FANTASY VERDICT: We love the general and what he has done for our Fantasy teams. Always a legendary bloke who looks after what we do with DT Talk and The Traders, but I think Hodgey’s Fantasy days are over. He is likely to be having a few rests during the year and we saw a bit of a decline in his game this year. Where he falls in Fantasy Draft will be a talking point of the pre-season – he should be drafted, but you’d want to make sure you have a bench option ready to go every week – especially for those trips to Perth. WON’T PLAY ENOUGH GAMES. FANTASY VERDICT: Going into his third season, Carlton will be stoked to have Kennedy into their squad and us Fantasy coaches could be picking up a bit of a bargain. He did have FWD status this season, but judging by his heat map, Kennedy will most likely be a MID only. While he hasn’t smashed it at AFL level in the star-studded GWS side – top scores of 87, 93 and 90 in his 19 games – he has dominated at NEAFL level. In 2016 he averaged 114 from 14 games and this year, in the games he was dropped from the senior side, he averaged 32 disposals, four marks, six tackles and 115 Fantasy points. WATCH-LIST. FANTASY VERDICT: The Bombers finally got their man. Back in 2015, Stringer averaged 75.7 which basically puts him under-priced by around 20 points from his best. It has been well documented about his personal troubles of the last two years but if he’s in the right mindset, we could see him kick 40+ goals and average in the mid-to-high-70s in his new colours. While 20 points is huge upside, it wouldn’t put in him the top bracket of FWDs. UNDER-PRICED. FANTASY VERDICT: Surely Lobbe ends up at the Blues purely as insurance for Kreuzer. If he is required for an injury that could keep Kreuzer out, then it’d be worth jumping on Lobbe who will receive a 30% discount for not playing in 2017. That discount takes him to be priced at 55 ppg, a long way from his 89.1 season in 2014. Consider picking up both Kreuzer and Lobbe in your Draft to handcuff the duo in case of injury. UNLIKELY TO BE BEST 22. FANTASY VERDICT: I’ve had a love-hate relationship with Wiiiillllssssooooonnnn, but I have some faith in him being a Fantasy option even though his numbers don’t totally stack up so far. Last year was the defender’s best, going at 71 points per game. With only two scores in triple figures, the upside may not quite be there to put him in the mix as a top 20 defender in 2018. A later draft pick but don’t be surprised if he breaks out in the purple. It’ll be interesting to see how he fits in with Connor Blakely who was a Fantasy revelation in his last few games prior to season ending injury. WATCH-LIST. FANTASY VERDICT: You’d think he’s there for depth, but if he does make the senior side, he will most likely fill the void as a run-with player for the Crows. A very durable player (played 130 games straight, not missing a match since debut), Gibson has had some decent Fantasy numbers in the past averaging 96.9 in 2014 and 90.4 in 2016. NOT GOING TO BE A LEGITIMATE OPTION. FANTASY VERDICT: Averaged 21 disposals, five marks and 79 Fantasy points in the NEAFL for the Swans. He spent time playing off half-back and through the midfield. Listed as a FWD in Fantasy this year, we can hope the Pies are keen to give the 20-year-old 187cm player a chance. BENCH OPTION. FANTASY VERDICT: Likely to be basement priced after discounting – if not, pretty close. Key position player who doesn’t find much of the ball – his best Fantasy score has been 76… but second best has been 47 from his 13 games. Depending on what we’ve got to choose from at the bottom end in Classic, Young is unlikely to figure as an option. DON’T EXPECT MUCH. Will average around his second highest score. FANTASY VERDICT: Given the right role at his home, there is 20+ points upside in Young’s Fantasy game. In 2016 he averaged his personal best 75.1 which looks like an outlier for his career considering all other years have been in the 40s and 50s. That PB took a 37 goal season. SANFL numbers this year were elite. Young averaged 28 disposals, five marks, six tackles and 117 points playing as a midfielder. If we can see this at the Suns, then lock and load with FWD status. PICK HIM IF HE’S PLAYING IN GC’S MIDFIELD. FANTASY VERDICT: If you’re thinking salary cap and AFL Fantasy Classic, it is a pass. Gibbs was fantastic last season going at 112 after being a bargain in 2016, increasing his 80 average to 105. I can’t see Gibbs having numbers much more than the low 100s (let’s call it about 104) with the likes of Sloane, Crouch Bros, etc in the team around him. Still, he should be a decent Draft pick but it will take some big kahunas to go with him in the first two rounds. Let someone else grab him around other midfielders that go at 110. NUMBERS LIKELY TO DECREASE. FANTASY VERDICT: Lock in your M9 right now… or maybe he is a starter for you? Harrison Wigg will get game time at Gold Coast and should knock out a decent enough average to be a profitable cash cow. This year in the SANFL, the 21-year-old averaged 25 disposals, five marks, four tackles and 99 AFL Fantasy points but is yet to make his AFL debut. In the JLT Community Series last pre-season, Wigg scored 87 from 66% TOG which made a few coaches keen on him. He then scored 37 from just over half a game before not making the squad in the third JLT match. He’ll be playing round one for the Suns and we will all be locking him in! OCTOBER LOCK. FANTASY VERDICT: A lot of us jumped on Balic when he made his debut in round three. It was a strange start for him. Just 35 points in his first game backed up by a solid 73, a week off because of a hip injury and then back in the side with a 91. His fourth and final game produced just 41 points and then he was out for personal reasons. This has seen Balic head home to Victoria and he’ll be playing at the Demons. Although he gets a discount to price him just under 50 and with some obvious upside, the MID/FWD may not quite be cheap enough. AWKWARD PRICE. FANTASY VERDICT: The much maligned former No. 1 draft pick boosts Port Adelaide’s 22 and their shot at the 2018 flag. His best season came in 2012 when he averaged 85.6 but he has generally been a bloke that knocks out season long averages in the mid-70s. For me, as much as I like him and hope that he has much deserved personal success, I really don’t think you’d be too confident taking him as a starting player in Draft and you’ll totally want to avoid him in Classic. PASS. FANTASY VERDICT: Well, well, well… West Coast has a thin midfield and Ah Chee could find himself with some more game time that he didn’t get at Port this season. With Sam Mitchell and Matt Priddis retiring, Ah Chee hopes he will get more opportunity over in Perth. Consistency has been an issue but that has come down to role within the team. He played just five games in 2017 and that will earn him a 15% discount on his output, therefore pricing him at under 50 points per game. This could be a cheap price to pay after averaging 92 in the SANFL across his 16 games this year. WATCH LIST. FANTASY VERDICT: Three years into his career, Adam Saad is yet to crack a Fantasy ton and has hovered around the 60 average for his 48 games. In 2017 he played all 22 matches with a high score of 83. Landing at the Bombers, Saad is likely to be running off half-back. With better players around him and in a more successful line up, I believe his numbers will increase, but judging by what he’s dished up over the last three seasons, he is unlikely to be a viable choice in any of the Fantasy formats. WATCH, BUT UNLIKELY TO BE AN OPTION. FANTASY VERDICT: This time last year I thought Motlop was good value, priced based on his average of 82.7… coming into the season fitter, a point to prove, etc. In 2017, Motlop averaged less than 70; more than 20 points less than his best Fantasy season of 89.7 from 20 games in 2015. Motlop averaged 80 or more from 2014-16. He should retain forward status and while he may not get extra midfield time, he is more than certain to increase price and could be a steal in Draft if coaches just think about his 2017 output. VALUE PICK AS A FWD. FANTASY VERDICT: Before going into depth on his career and potential role at the Dogs, Crozier will be arguably under-priced next season after averaging 66, nine points less than his breakout year in 2016 of 75. His higher averaging season came off the back of a role that saw him playing off the half-back flank. From round 10, his next run of scores were 88, 107, 87, 84, 89 and 90 – making a few Fantasy Classic coaches bring him in hoping the role change was permanent. Jason McCartney’s words make us think he could be in the mix as an option this season: “We see him primarily at half-back which, with the retirements of Bob Murphy and Matthew Boyd this season, will help our defence transition in 2018 and beyond.” Looking at heat-maps and his role this season, he’s probably going to have FWD status, possibly MID/FWD. PRE-SEASON WATCHLIST. FANTASY VERDICT: So far in Impey’s career, the Fantasy scores haven’t been there. Used on a wing and as a forward, his top score in 2017 was 86 when he kicked four goals against the Lions in round six. The last two seasons, his third and fourth for the Power, has seen him average 57. The talk from the Hawks is that he’ll be playing off half-back and through the midfield. This should see a boost in his numbers, but I don’t think we’ll be picking Impey based on this information. Awkwardly priced as we’ll most likely get better output from cheaper players and not going to be in the mix in Draft leagues. THERE’S SOME UPSIDE, BUT NOT MUCH. FANTASY VERDICT: This excites me as an Essendon fan. Smith has had knee issues in the last two seasons, which hasn’t seen him hit the Fantasy peaks of 2014 where he averaged 94 from 21 games. While he hasn’t shown he has a high ceiling in Fantasy, that is probably due to role and opportunity at the Giants. I can see Smith getting more midfield time to go with his half-forward role in the red-and-black. Priced in the low 80s, there is 10 points or more upside and depending on who gains or retains FWD status in Fantasy, we could see him as a top six throughout 2018. ONE OF THE TOP FORWARDS. FANTASY VERDICT: Lever is what he is… a key position defender. Not often do we see players of his ilk being Fantasy relevant, but he has the capacity to register decent scores. This year he knocked out two tons but we’ll generally see him average around about 70 across his career. Depending on how the Dees structure up – considering they have a couple of decent keys in the McDonald’s – maybe he can increase his already impressive mark count? NOT QUITE RELEVANT JUST YET. FANTASY VERDICT: I feel sad writing this. Rocky has been a Fantasy legend since his cash cow days in 2010 when he played 19 games to average 87.2, following up with 112 the following year and peaking with the world record average of 134.7 in 2014. While I want to think that the pig will pig, could we see Roy’s least favourite team, the Power, ruin his favourite Fantasy Pig? Hmm. It’s early October and we don’t really know the full picture, but gut feel is that he will be predominantly MID with stints up forward – sharing time with Robbie Gray. Who knows, he could be MID/FWD again like his early days? I will probably still be sucked in by the charm of Rocky and his potential regardless… but it is a limited risk in my opinion due to being priced at a 103 average, the cheapest he’s been since 2013. Depending on the thoughts of your Draft league, you could get him as a steal towards the start of the second round – that is unless Roy is in your league. WATCHING ROLE, BUT STILL A PIG. FANTASY VERDICT: Good for the Bulldogs, but he’s not on our radar for Fantasy. Despite being dropped towards the end of the season, this was Trengove’s second best season, Fantasy-wise. He averaged in the 60s, only bettered by his 2016 season – where he played a lot of time as a ruckman – when he pumped out 69. The Dogs will benefit as he will most likely play as a key defender (according to the many hours of Trade Radio I’ve already listened to!! ), with some pinch hitting in the ruck. I don’t think he is Fantasy relevant at all. PASS. Discuss the trades and any Fantasy value you find in players at their new club in the comments. Depends on where S Gibson goes he could be an interesting player to look out for as I’ve always thought he had Fantasy potential. He has never been in my side but with the right environment he could be one to watch I think. 32 in may won’t be picked up. I think I’ll ignore every bit of advice you give next year. Cheers. A pig at the power. Gosh I hope that deal is done. Then hopefully the traders will start to like the power a bit more. Some interesting quotes from article on Rocky’s move. Power coach Ken Hinkley has earmarked a half-forward/inside midfielder role for Rockliff, working in tandem with Robbie Gray. “I feel like I can play multiple positions and I think they see that as well,” Rockliff said. We’ll be doing our first pre-season podcast a couple of weeks after the Trade Period. Hopefully we know a little more then! It’ll be an interesting talking point of the pre-season. Warnie, do you think Rocky is in with a shout at being named FWD/Mid for start of next season? His role was quite deep forward in those last few games… he was more of a forward this season than Taylor Adams has ever been a defender? No chance to be FWD/MID at the start of the season. 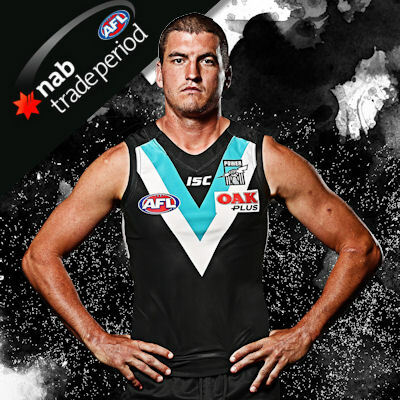 Interesting that port only showed fwd highlights in the hype reel when they traded him in. THEY BUILT A WALL…A GIANT WALL! Nice to see some rookies moving clubs. Wigg is a great possibility to get gametime at the Suns next year and should be good. I’m hoping Collingwood give Sam Murray some games as well. Do you think Wilson’s departure opens up the door for Matt Buntine at GWS? Is he an option for next season? There will need to be some transitioning. Heath Shaw will probably be playing his last season. Backline watch for GWS will be a big part of the pre-season. I’ll let you in on a big secret. Player prices are based on their 2017 average multiplied by the magic number. As above, I’ve called the MN 6900 based on a new Salary Cap of $12.6M (the Official AFL one). I’m probably wrong, but that’s a projection based on this years magic number in comparison to the salary cap. Thoughts on lobb with Mumford gone? Might squeeze in top 5 rucks for 2018. Wouldn’t pick Motlop at the cats, wont pick him at the power. Will he turn up fit or fat? Wigg and smith (preseason dependant) are tempting.